Red Bull's Daniel Ricciardo dedicated his victory in the Malaysian Grand Prix to the late Jules Bianchi. Ricciardo was a close friend of the Frenchman, who died in July 2015 from head injuries sustained in a crash at the 2014 Japanese Grand Prix. "I want to dedicate this one to Jules. I've been waiting for a victory, waiting to dedicate this to him. "My life changed since that incident. I'm extremely grateful and appreciative of everything I've got," he said. Ricciardo, 27, won three times in the 2014 season, his first with the senior Red Bull team, but was denied two victories earlier this year as a result of actions by his team. In Spain, a questionable strategy choice handed team-mate Max Verstappen the lead in his first race for Red Bull, and the Dutchman went on to win. At the next race in Monaco, Ricciardo was delayed at a pit stop, allowing Lewis Hamilton past for the victory. Ricciardo said: "I believe a positive mindset and perseverance has kept us in this fight." The Australian held off Verstappen to win in Malaysia, a late strategy call by the team to stop them under a virtual safety car allowing both to battle to the end on fresh tyres. Before that, Verstappen had been pressing hard and had the advantage because his tyres were several laps fresher. 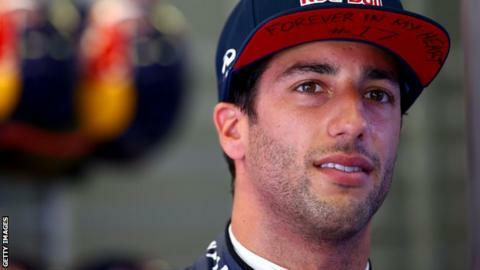 Ricciardo told BBC Sport: "We were absolutely allowed to race and the team got on Max's radio as well, I believe. My engineer said: 'You will race Max, so we're asking you to bring the cars home but you are allowed to fight.' It was clear we could keep at it - just nothing silly I guess. "This is a big moment. When I crossed the line I didn't know what to do. The celebration felt a bit strange. "It sunk in pretty quick. I held off Max well - we fought hard and clean and I think the team will respect us for that." The Japanese Grand Prix at Suzuka is next weekend and wet conditions - in which Red Bull excel - are predicted at this stage. Verstappen said he was happy with second place, adding: "It's the perfect result for Red Bull. "Until the last lap we were pushing really hard," he said. "The team said we were free to race but in a clean way and that is what we did." Who'd be a Formula 1 mechanic? What's it like to drive an F1 car in the rain?